So it was days before Christmas, and discord was quiet as a mouse, not a ping heard anywhere throughout the house. Till one Redditor revealed a tell-all screenshot on what had been up till then the best-kept secret this week, that corporation Cruisers Crew were not just a few hours away from ninja anchoring a Keepstar, they were mere hours away from ninja anchoring a Keepstar within jump range of Init / Goon space! So, with the gig up, moves were made all across the cluster. The GOTG coalition and several others including NC, heeded the defenders call to come to their aid in subcaps (duh, short notice) because well, never not kill Goons however ridiculous the odds, and the price was right or so I hear. With that being said it doesn’t mean we weren’t going to whore in on the increasingly inevitable keepstar kill, and a couple of stray Goon dreadnoughts to boot before a swarm of fighters forced our Cerberus fleet to tether and, yes, do a conga line. More than a few snippets gleaned from pings and fleet chat piqued my interest to dig a little deeper here. Who were these guys with a mere handful of capitals standing up to the massed blob of Goons and friends who were, for a while at least, trading them ship for ship? Why on earth would anyone WANT a keepstar in Syndicate? It may have some decent moons, and the fact that it’s a doorway into Fountain and Cloud Ring cannot be ignored either, as Initiative surely knew back when Mercenary Coalition was playing keepstar games with them there. But, while I’m no stranger to making reckless and poorly thought out decisions in eve, anchoring a keepstar within jump range of… ANY nullsec alliance you’re not blue with is just, well, hard to justify without a major coalition going balls-out to support you… and organizing that kind of support can’t often be organized with a 6-hour deadline. So, I arranged a convo with the defending corp’s CEO. That Yossarian > 1st things first, tell us a little bit about your corp and how you became CEO? That Yossarian > I see. And you most recently were in the DRF coalition, right? Kurisu Makkashi > Ghost Legion. I’ll explain. After the placid campaign, my rl took a hit. Divorce, military service, etc so I quit eve and that was that. I came back due to a friend asking me too he handed the reiteration of cruisers crew now current and I’ve built our corp up over the last year. We went from piracy to some nullsec during galactic skyfleet. Many of my old pilots and old guard returned. A few months ago we began to kill capital fleets and have had successful escalations vs imperium as that has been our sole focus we fight snuff, Init, galmil, and goons. We ended up joining ghost legion to help Fafer and the DRF but our roots and ties to piracy and self-autonomy prevailed. Our disobedience to his direct order NOT to drop the keepstar was my doing, though we tried to ninja it. That Yossarian > I see. so being kicked from DRF was a direct result of the Keepstar drop? Kurisu Makkashi > Correct. Though Fafer confirmed his dissatisfaction, he still treats cruisers crew with respect and has been our largest supporter in pvp. We paid the price of trying to represent a stand-alone entity in eve online vs the masses. We wish to encourage other corps not to be afraid and to do their best. It doesn’t require kissing the ring and we want to set an example that small corps are credible, capable, and talented enough to merit a threat that drives the content as u saw last night. 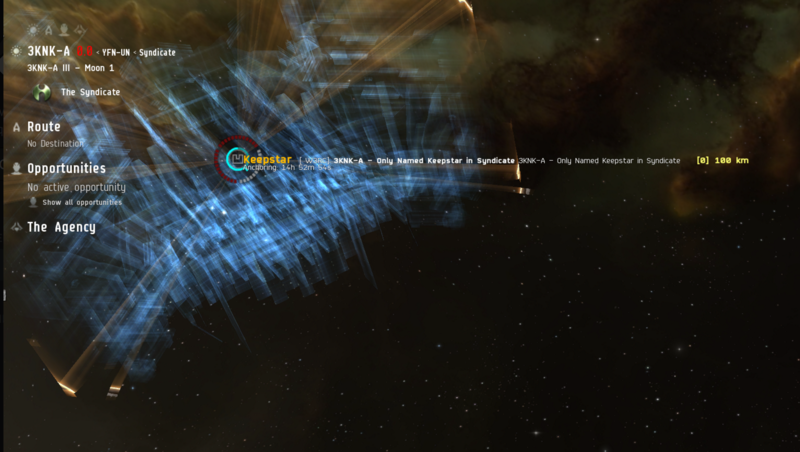 That Yossarian > The keepstar DID actually almost ninja drop though. We’re curious, was there any effort on the part of anyone stumbling into the system for you to “Buy their silence”? Kurisu Makkashi > Not at all. Our attempt to ninja was a gamble. That Yossarian > So, when you saw the Reddit post, what was the first thought to cross your mind? Kurisu Makkashi > haha let’s give a good fight and rally who we can. We considered several options but none seemed better than to show force and put up a fight. We all play eve for the same reason, to ultimately discharge ammo and receive kill marks. This is eve, you miss every opportunity u don’t take. That Yossarian > So what’s next for you and your Corp then? Kurisu Makkashi > you’re not wrong lol. We dropped the keepstar to show that we could. Without a certain idea of what the outcome would be, it was a risk and gamble we took. An opportunity to represent ourselves and capability, while rallying fellow eve capsuleers. We welcomed the content, and defy the odds at every opportunity we can get. Our corp began as t1 cruiser roams. Now, look at us. What can I say? I’m proud of our corp and what we’ve accomplished, failures aside. The harsh realities of eve are unkind, but loyalty, camaradarie, and dedication of my corp members…is what keeps me playing eve online. Also…we are thinking of getting another keepstar next month. That Yossarian > Interesting. Well, the odds were what they were, but you guys certainly made an impression, one way or another. Thanks for your time. That Yossarian > Never not kill goons…. 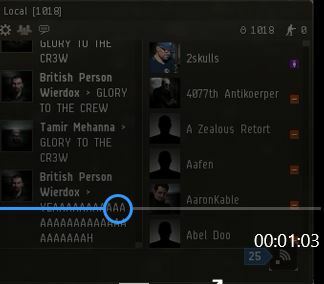 The Crew was defiant in Local chat to the last. Despite the obvious truism we finished off with there, I can’t even really even find any particular Goon villainy here, it’s not as if I’ve ever passed upon low-hanging structure kills, and anything as potent as a keepstar would provoke a similar response from anyone within jump range. One observer in local chat mentioned regarding any “strategy” that might have precipitated the decision was that getting 1000 people present at your corps keepstar kill constitutes a PR op success. I suppose that’s one thing they can take away from this. Might this be the first ebb of a brave new meta in eve recruitment tactics? Probably not. The list of corps that can afford Keepstars is still a rather short one indeed, and the killmail of this one alone is enough to merit max hype for the Crew’s next attempt to anchor one. The end result of this episode, however, was that pretty much everyone who could show up on short notice got on a keepstar kill just in time for Christmas. Stick to only two colours (one should ideally be blue – the colour of trust) on a white background and avoid flashing buttons in any respect costs. As The Organizing Wiz, Ilene Drexler works with residential clients who are typically “overwhelmed by their stuff” and who want to get and stay organized in their home or home offices bitterfeld we have free will Satan Adam and Eve a forbidden fruit and a talking tempting snake. Writer: mcilwain popec When making an attempt to attract girls on-line, your profile will include an attractive description about who you are as a person. Keep Your Date Fascinated: Listed here are just a few questions to ask on your first date to maintain issues transferring alongside and fascinating escorts but why should I wait for her, who don’t love me.